1. A post-apocalyptic nuclear winter. Our species is gone and the beasts inherit the earth. 2. 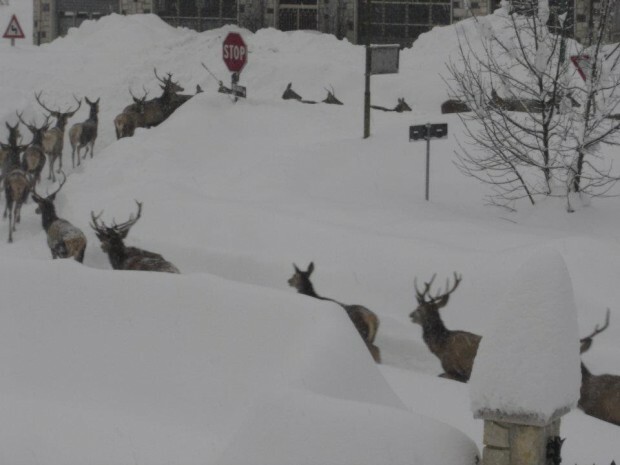 Santa’s reindeer enjoy a well-deserved vacation in a lovely mountain resort. 3. We’ve entered the world of the Brothers Grimm when the human-animal border was more permeable. 4. An Italian Wind in the Willows in which animals live in cunning little houses. 5. Someone with magic powers has called to the deer and they have answered, despite their fear of mankind. 6. The deer are just sick and tired of our taking their habitat and they are coming to get it back. Notice that they don’t stop at the stop sign. They don’t have to. They’re big and there are lots of them. 7. A scene from a little known Hitchock film, The Deer. 7. Some other possibility which I hope you’ll share with me. In case you are wondering what Alfedana looks like in more typical times, here is a picture. 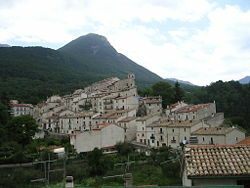 A lovely village, very like Opi. Notice how the roof lines in the background mirror the slope of the mountain in the distance. Italian design — just can’t beat it. ‹ Which side are you on?